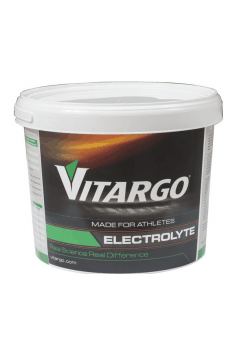 VITARGO Electrolyte contains Vitargo®, a patented, high molecular weight carbohydrate with an average molecular weight of 500,000-700,000. It’s unique, because it’s specially processed to yield a molecular profile that is massively different from the sugars (e.g. Glucose, Fructose) and Maltodextrin found in many products. The molecular weight of Maltodextrin is around 1,000-10,000 and Dextrose is approximately 180! It has generally been accepted by science that prolonged submaximal exercise is limited by the availability of muscle and liver glycogen stores and that these stores increase when carbohydrate intake is high. It has also been shown that the rate of glycogen (stored carbohydrate in the body) synthesis is highest in muscles in which the glycogen stores have been depleted by exercise. The rate of glycogen synthesis following exercise is of importance for athletes during training sessions with repeated periods of heavy or submaximal exercise, as well as during competition especially when several periods of intense exercise are performed. Synthesis of muscle glycogen from ingested carbohydrates is dependant on the transport of glucose across the intestinal mucosa and the muscle cell membrane and on the enzymes responsible for glycogen phosphorylation and synthesis. Blood glucose concentrations are influenced by the influx of glucose from the stomach, via the intestine and into the blood. It has been shown that the osmolality of an ingested solution can interfere with the emptying rate from the stomach. Thus a high osmolality may delay gastric emptying which could delay the release of glucose from the intestine. With Vitargo® a very low osmolality, but high carbohydrate drink can be made! The Vitargo products are a revolutionary energy source used by Olympic athletes, doctors and millions of people who want to improve health, physical condition and appearance. Energy drinks of this company contains glucose, corn starch, maltodextrin, and sucrose. If you are serious about physical performance, you need to select the appropriate source of energy. Athletes, who usually replenishing fluids during exercises, feel stomach cramps. Vitargo supplements empty stomach more than 2x faster than leading sports drinks. Clinical studies have proven that using the company's supplements - glycogen levels are replenished 68% faster, which helps to increase productivity by 23% just two hours after ingestion. With Vitargo supplements you can get at least 4x more energy than with products of other brands. It is a favourite brand among athletes around the world. starch, acidity regulators E330, sodium citrate, calcium gluconate, magnesium gluconate, aroma, potassium gluconate, sweeteners (E950, E951 (contains aspartame (source of phenylalanine)), dye (riboflavin for citrus taste, beetroot powder for grape flavor). Supplement to use before training. Provides an increase in strength and stamina. Supplement increasing the release of catecholasmines, effectively supporting the fat tissue reduction process.